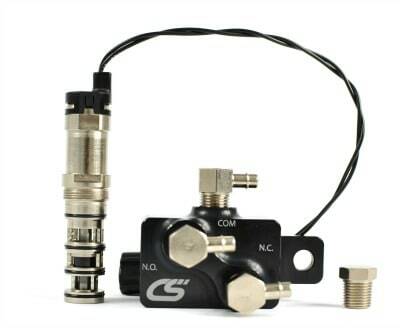 Produktinformationen "Corksport Boost Control Solenoid"
Take control of your boost and performance with the CorkSport Mazdaspeed Electronic Boost Control Solenoid (EBCS). Utilizing the latest technology in solenoid controlled air valves, the CorkSport EBCS outflows and out responds the competition. It builds boost faster and minimizes boost spikes and creep. The CorkSport replacement EBCS features a 3-port design that has the flexibility to control all boost control setups, such as bleed and interrupt for internal wastegates and interrupt or push-pull for external wastegates. Also, it is designed to fit in the OEM location or on top of the valve cover. It’s fitted with an OEM electrical connector for a plug and play installation. No soldering or crimping necessary! Installation is easy! Immediately feel the difference in horsepower! Share your CorkSport experience in the Reviews section above! Energizing response time of 0.0007 seconds. De-energizing response time of 0.0006 seconds. A balanced valve design so the boost pressure will not affect response time. Frequency operating range from 0-1000 Hz. 3-port design: The CorkSport EBCS can be used with all wastegate setups, including internal wastegate, bleed (OEM) and interruption, and external wastegate. Material: The manifold is made with 6061-T6 billet aluminum and finished with black anodizing for high strength and great looks. It’s threaded for 1/8 NPT or AN fittings. Boost ports: Electroless nickel plated brass that won't flake or dull over time. Solenoid valve: Stainless steel for long lasting durability. Compatibility: Looking for the ultimate in performance? 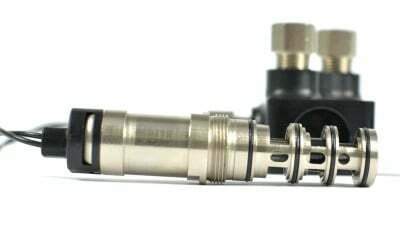 Pair your Boost Control Solenoid with our innovative Mazdaspeed Max Flow Fuel Pump Internals. The CorkSport community reviews say it all! Made in the USA: Engineered, manufactured and assembled by CorkSport in Vancouver, Washington. Research: Check out our whitepaper on the EBCS from our engineers. 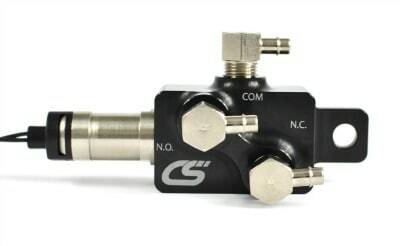 The CorkSport EBCS does require the use of an aftermarket tune and access port. Due to the increased efficiency of the CorkSport EBCS, you CANNOT install the EBCS without making tuning corrections. Over boosting will occur. It will take you 30 minutes to install your solenoid with our instructions. Weiterführende Links zu "Corksport Boost Control Solenoid"
Kundenbewertungen für "Corksport Boost Control Solenoid"